Yesterday, I was posted about the IF function of the Microsoft Office Excel using the 2007, 2003, or even 97 versions that you can use to perform a logical calculations of your worksheet data. 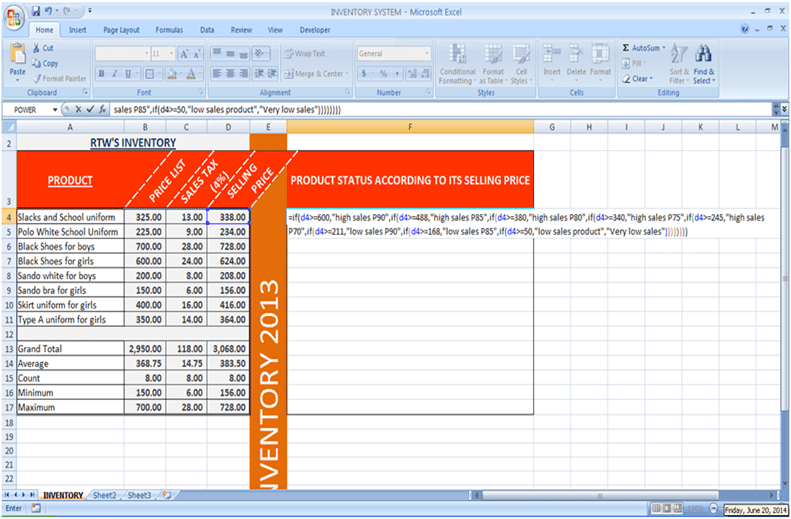 Now another use of the Microsoft Excel using the IF function is the multiple IF functions. This is understood that you can perform a series of multiple conditions base of your logical reference of your worksheet data. Using the logical test of greater than or equal to or like this (>=). This logical function can perform a multiple list of conditions using the autofill tab. By dragging your mouse downward after your syntax is logically correct base of your product entry of your worksheet. Logical_test is any value or expression that can be evaluated to TRUE or FALSE. For example, A10=100 is a logical expression; if the value in cell A10 is equal to 100, the expression evaluates to TRUE. Otherwise, the expression evaluates to FALSE. By combining the above statement using the syntax it will results a multiple conditions base of your logical data(reference) by repeating itself the reference data in the first reference in a rows and columns. But before it, calculate first the logical test reference to evaluate exactly the highest reference and the low reference base of the logical of is greater than or equal to. Just do this example below: or see the above example shown in the picture above. Be sure to put exactly its of the logical functions separated with comma and the open parenthesis and close parenthesis at the end of your syntax.